Sanmina’s electrical modeling tool set enables customized product solutions that meet challenging performance requirements. We understand that our customers are driven by time to market. Our goal is first-pass success in all of our projects. We blend a thorough understanding of our internal manufacturing processes, deep material technologies expertise and our own solutions acceleration IP to create a balanced design concept. Then we model to predict the performance across the range of product performance requirements. 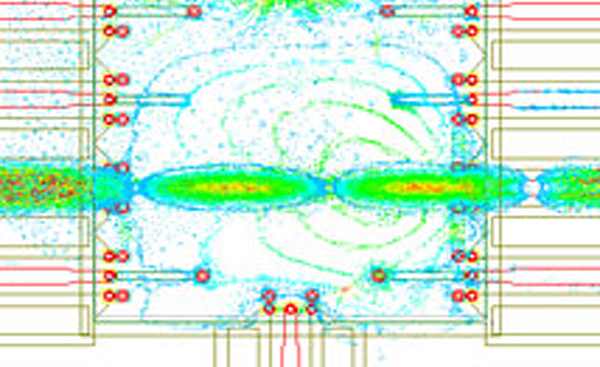 Our modeling and analysis activities can be grouped into four areas: system simulation, 3D electromagnetic (EM) interactions, signal integrity verification and circuit simulations.There are many potential design challenges that would benefit from detailed electrical modeling and analysis. The following examples simply illustrate some common scenarios. At RF/Microwave frequencies, high-speed signal performance is largely defined by the underlying interconnection performance. RF modeling provides detailed understanding of how each transition contributes to the overall performance whether at the wirebond to die, flip chip, package to package or connector levels. Similarly, it allows the designer to analyze the RF performance of multilayer transmission lines, interlayer via transitions as well as BGA/LGA transitions. Our models blend our own proprietary IP with design-specific details such as accurate geometry, material properties, manufacturing tolerance variations and adjacent structures for improved simulation detail. The result? Confidence that our designs meet specifications and the possibility to have first-pass design success. Custom packaging imposes certain restrictions on power plane design and decoupling requirements that are not intuitively obvious. Problems arise from improper power plane design and suboptimal decoupling layout including intermittent, hard-to-debug failures. At Sanmina, we focus on generating proper package, module or PCB power plane designs that meet ASIC requirements by generating equivalent circuit models that can be analyzed in conjunction with the ASIC circuit models. We also base our detailed decoupling analysis on actual layout information and sound capacitor models for improved accuracy. Both of which contribute to our first-pass design success, and our customers’ early-market entry. Sensitivity analysis modeling seeks to define the manufacturability and cost-performance envelope of a product design. The former determines whether the mechanical component and manufacturing tolerances will negatively affect production yields. The latter seeks to understand whether the design will continue to meet performance specifications given the range of possible electrical tolerances from both component and manufacturing processes. This includes a deeper look at understanding the impact that technology selection has on product performance versus cost optimization. In the end, our modeling confirms our ability to design without tuning requirements at the manufacturing stage. All of which raises production yields and decreases customer costs.